As a church our vision is that we are ‘a caring community with every member equipped to demonstrate Christ, working with others to advance God’s Kingdom in Chard and the world’. Our values are the basis of all we do – that we seek God, love generously and expect positive transformation in our personal lives and together as a family. 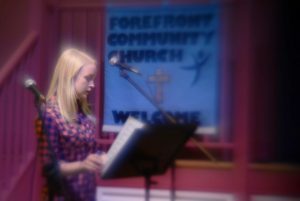 Forefront has no formal membership list but we do invite those who want to worship with us to make a public commitment to the church and its work. All who have come into a relationship with God through repentance and faith in Jesus Christ are members of God’s church and can worship here. In addition, we encourage everyone who is interested in the Christian life to attend our meetings and experience a loving, non-judgmental welcome. We expect those who do join us to take personal responsibility to grow in relationship with God and develop the likeness of Christ, as the Holy Spirit enables.